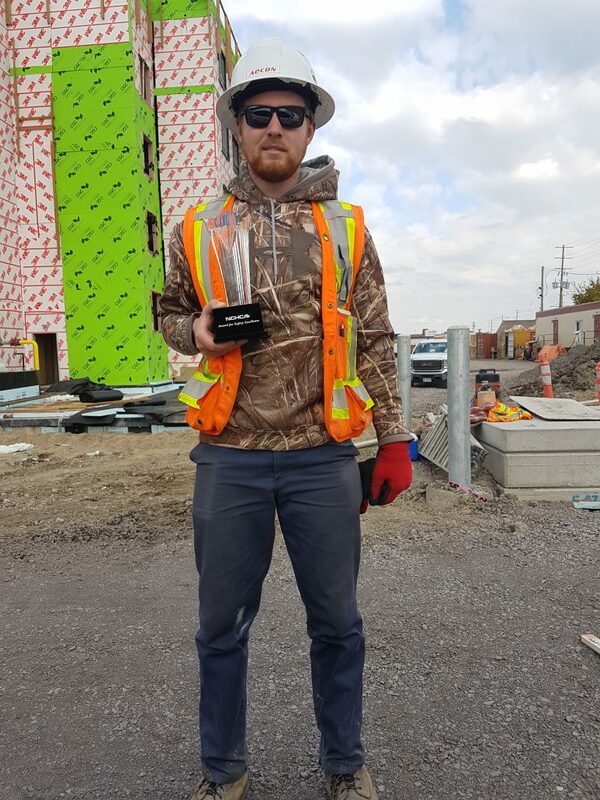 The September Safety Award recognizes Justin Montgomery, Foreman, Aecon Construction Ontario East Ltd., for recognizing a serious safety issue and taking action to ensure the safety of workers. An Aecon crew was working in a basement parking garage with a ventilation system in place. A third-party concrete crew working in the garage isolated its work area with tarps, which blocked the main outlet of Aecon’s ventilation system. Justin recognized the danger and warned the third-party crew that they were working in a toxic atmosphere with levels of CO up to 200ppm. Both crews exited the area to wait for CO levels to stabilize. The tarp was taken down, safety talks were given to inform workers of the hazards of a dangerous atmosphere, and the ventilation system was modified to offset the additional workers and equipment. Justin’s proactive approach ensured a safer jobsite and prevented potential injury. Congratulations Justin!